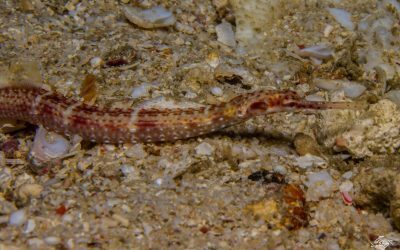 The Longnose Hawkfish (Oxycirrhites typus) is not a common fish in Tanzanian waters. 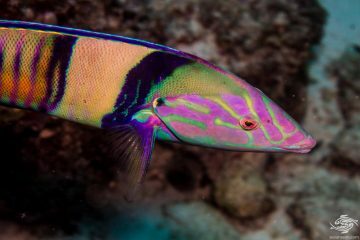 They tend to be found quite deep and as a result are not often seen by recreational divers. The specimens in the post were all photographed below 30 meters on Fern Wall in Dar es Salaam, Tanzania. 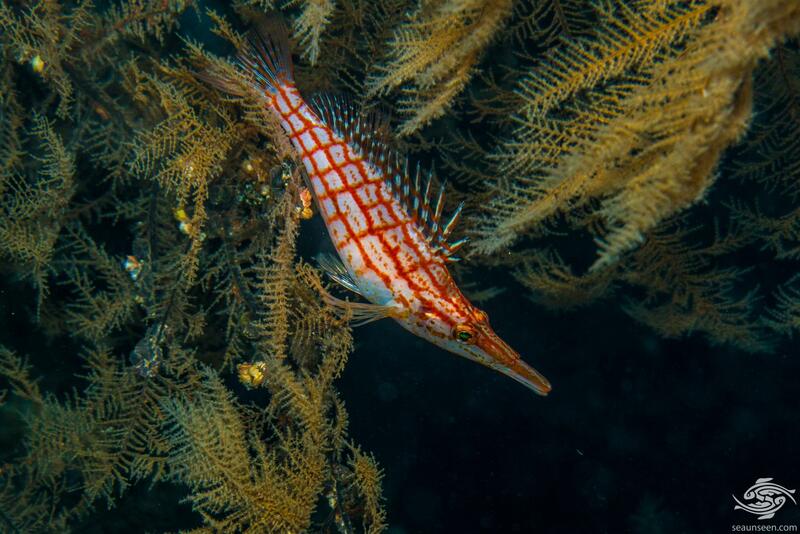 The Longnose Hawkfish has a whitish background colour with series of red horizontal and vertical lines across the body forming an attractive pattern of squares. 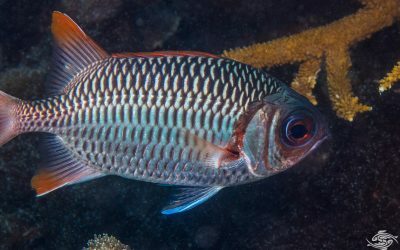 The dorsal fin spines are red and white with tufts of cirri on the top of each dorsal spine. 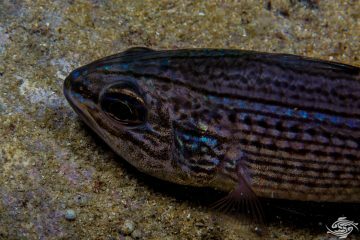 The spines on the caudal fin are similarly colored. 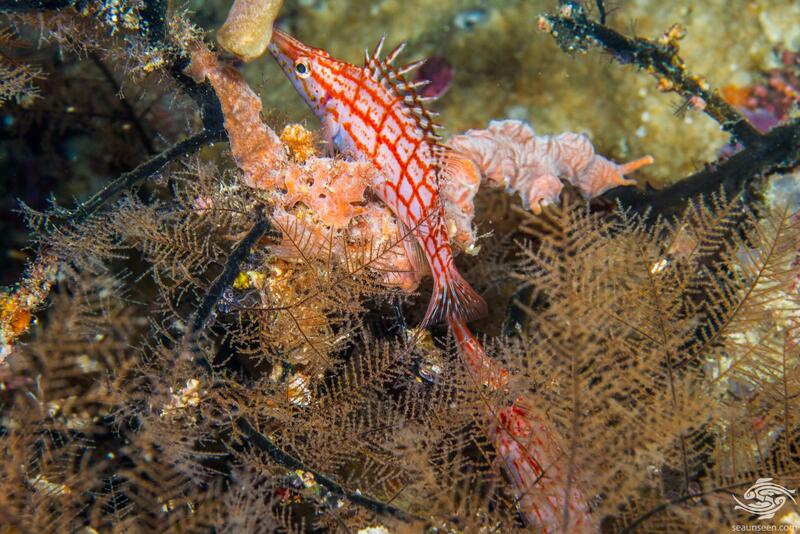 The pectoral fins are as with all hawkfish comparatively large and are without scales. 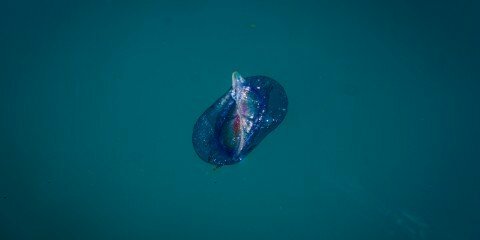 They can grow up to 13 centimeters and are quite often seen this size in the ocean. Their eyes are slightly bulbous giving them a good field of vision. 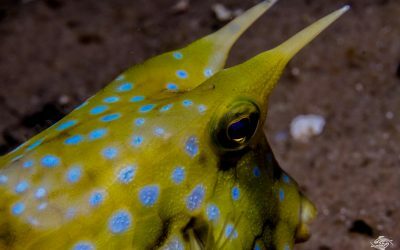 Their preferred prey are fairly small and pass by in the current and a good field of view and sharp eyesight are a necessity for them. 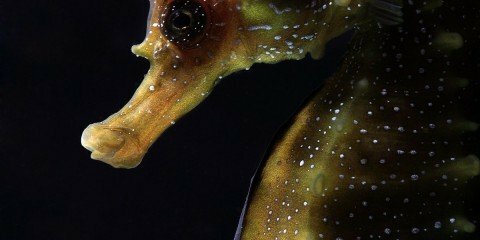 The snout is long and tapered and the mouth is proportionally quite small. 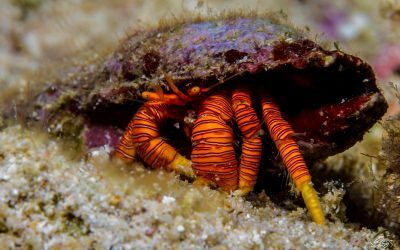 They have conical shaped teeth suited for grabbing small crustaceans. 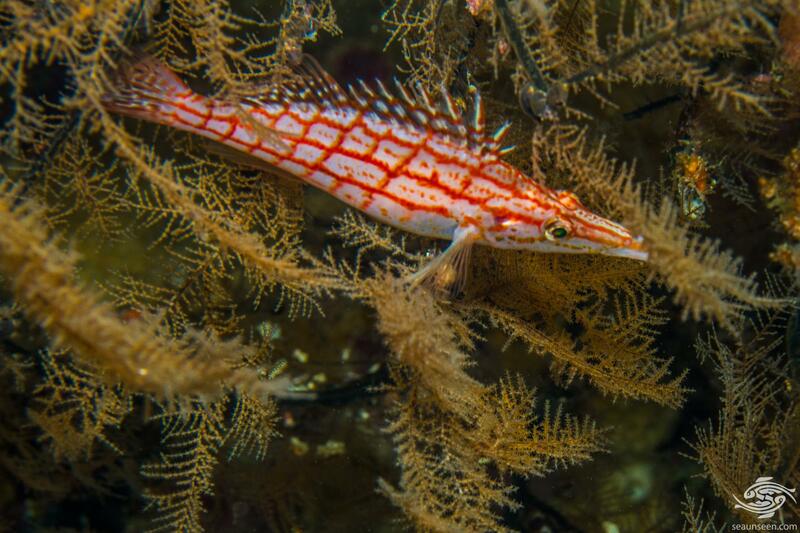 The Longnose Hawkfish is almost always seen perched on a gorgonian fan or black coral which tend to mainly be found quite deep and in areas of high current. 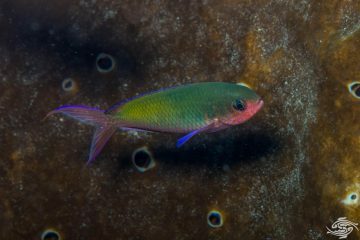 As can be seen in the images they use their pectoral fins to sit on the corals. Because they have no swim bladder they sink when not swimming. 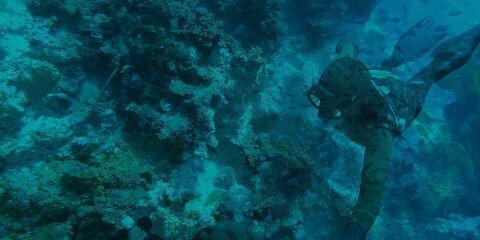 Therefore when not feeding they are usually sitting motionless on the corals watching for prey. This conserves energy. 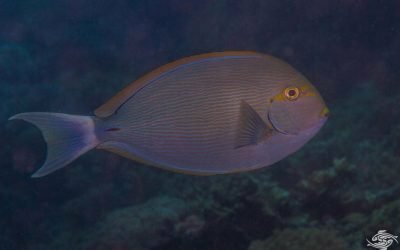 The advantage of not having a swim bladder is that they can make rapid darts upwards and downwards without having to adjust the pressure of a swim bladder. This gives them an advantage when snatching passing prey in the substrate as it allows them to move faster. 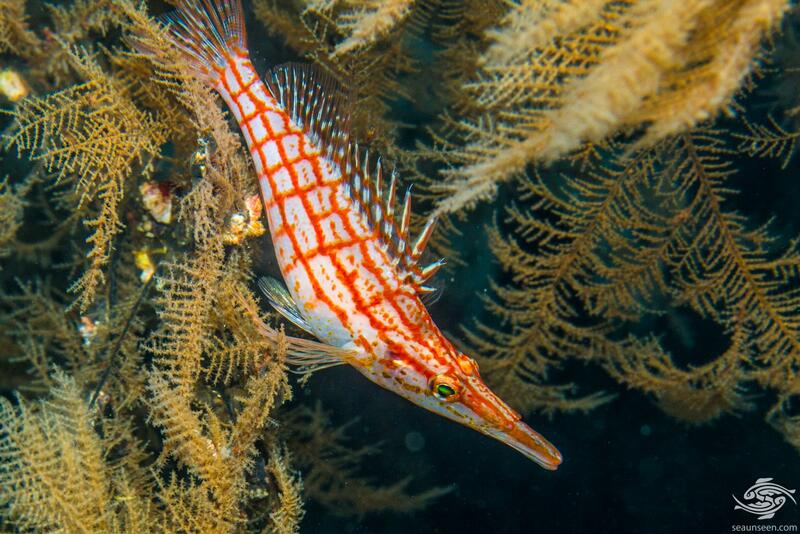 Longnose hawkfish are found across the Indo West Pacific area mainly below 20 meters in depth. Their range extends from South Africa up to the Red Sea, northwards to southern Japan and across to California and south to Columbia including the Galapagos Islands. They are usually associated with Gorgonian and Black corals and are most commonly seen on deep walls. 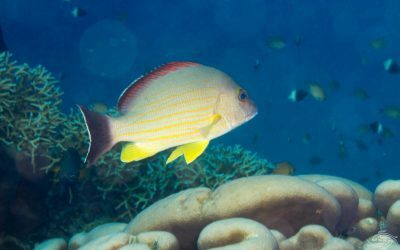 The corals are usually always in a high current area and provide ideal perches from which to view prey passing by in the substrate. They additionally make good hiding places to go back into if they feel threatened. 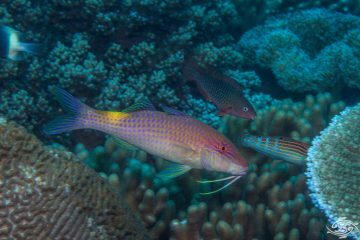 The Longnose Hawkfish is a predatory carnivore as its name suggests and its main diet consists of benthic or free swimming crustaceans. 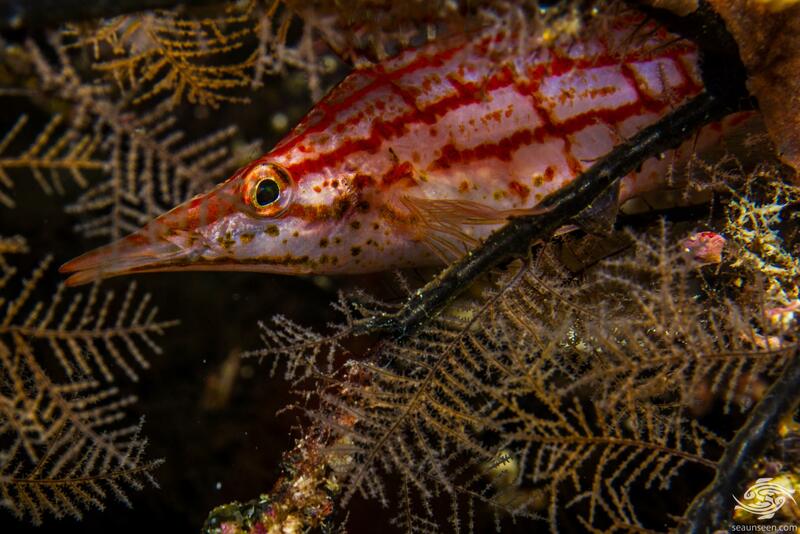 Longnose Hawkfish either form monogamous pairs or small groups with two or possibly more females. 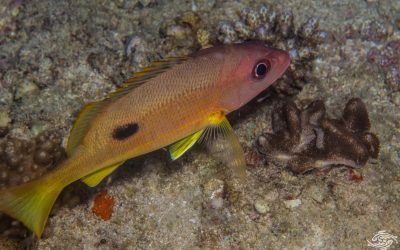 In groups the largest female is resident in the same coral as the male and the smaller females reside in corals close by. In the evening around sunset a courtship dance takes place and during dusk the eggs are released and fertilized. 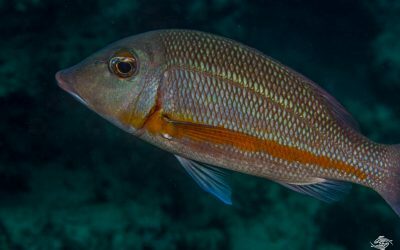 The male swims around the female raising its dorsal fin and after mounting the female, at dusk both fish dart into the substrate and the eggs and sperm are released simultaneously. 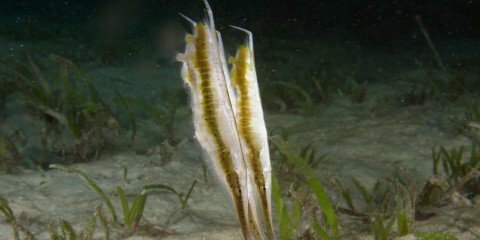 Although they spawn in aquariums the fry have not yet been successfully raised to our knowledge. 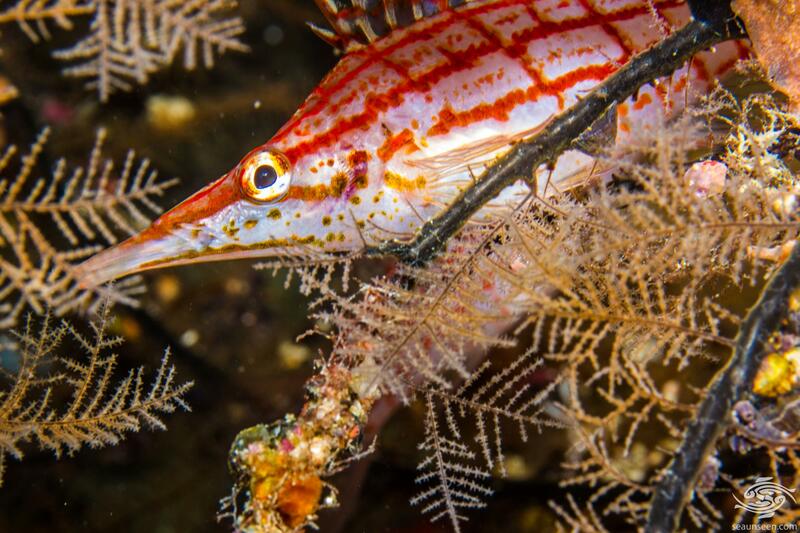 The Longnose Hawkfish is a protogynous, synchronous hermaphrodite, meaning that it starts life as a female and changes into a male later in life. 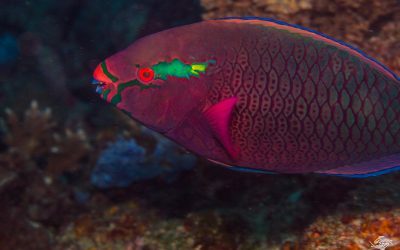 Although the males are said to usually be larger than the females, we have seen similar size pairs living together in Black Corals in the wild. 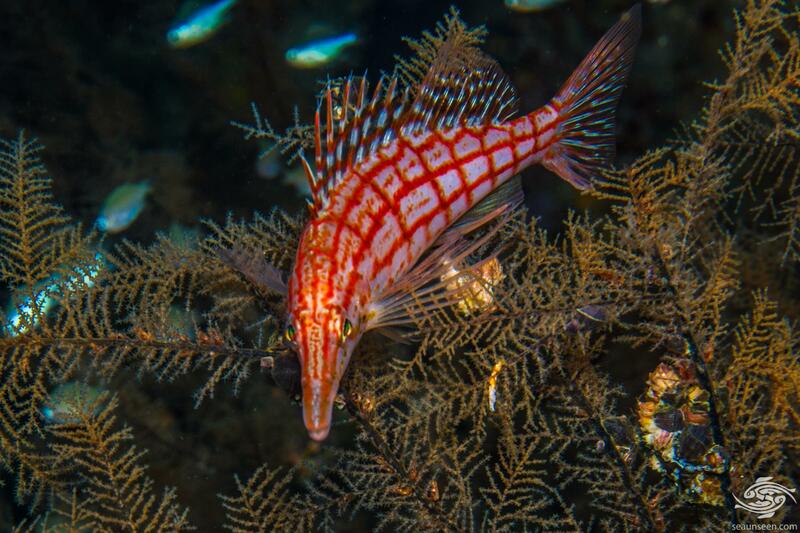 Longnose hawkfish are quite sought after by aquarists. 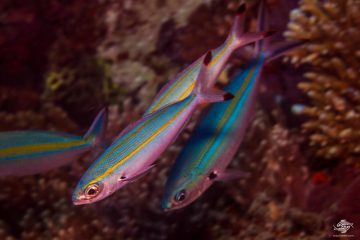 They are intelligent healthy fish with a lot of character. 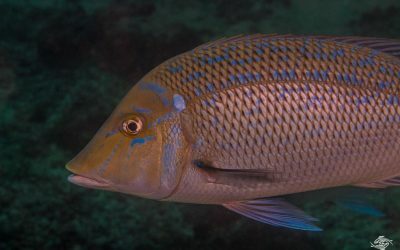 Note that they actively hunt crustaceans and smaller fish that can fit in their mouths. 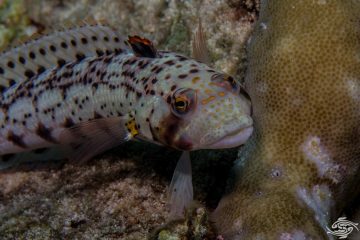 Being fairly peaceful fish their tank mates should be chosen with care and other species of Hawkfish should be avoided. 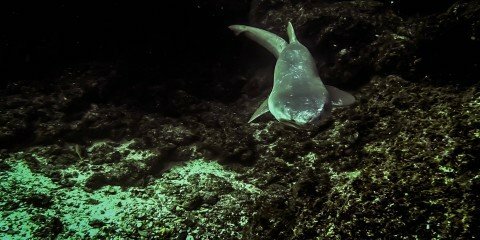 After some time in a tank they may become territorial but this can be dealt with by rearranging the tank. They require a large tank with spots to perch on and are relatively easy to get onto prepared foods. Additionally they are known for jumping and the tank should be well sealed.